Rice is the seed of a grass species. It is the staple food of over half the world’s population and it is consumed especially in Asia. Throwing rice at a newly wedded couple has been a long-standing tradition. However more recently we’re cautioned not to throw rice as it is harmful to birds that might eat it. Because of this, you might also think that rice is bad for ducks. The reality is that rice poses no harm to ducks. Wild birds will feed on uncooked rice all the time and many of them depend on rice fields to maintain fat in the winter. 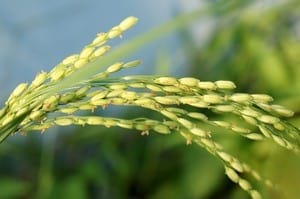 There is also no risk that rice grains start sucking up water when eaten as dried rice grains are actually pretty slow to absorb liquid unless it is boiling. Rice still in the hull, brown rice, white rice, cooked or uncooked won’t hurt ducks at all. Just make sure the food isn’t moldy or rotten. Conclusion: ducks can eat rice both cooked and uncooked. Did you know that throwing rice at a wedding being bad for birds was a myth? Let us know in the comment section below.